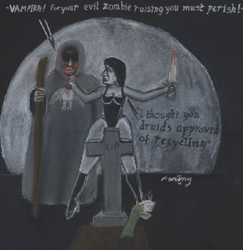 Here for sale a selection of hand painted and hand drawn pieces of art by Marcony. Prices do not include shipping or such tax as must be paid to import items to your country unless otherwise specified. Pleae Email me on Marcony@StateOfAnchovy.co.uk to enquire and buy. Sale Price £30 (UKP) +P&P (and import tax if applicable to your country). Pleae Email me on Marcony@StateOfAnchovy.co.uk to enquire and buy. A hand drawn pieces of art by Marcony. 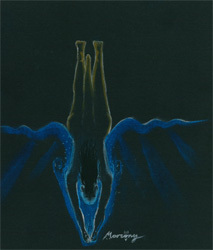 Created with pastel on heveay black paper as one of an on going series of charaters diving. Sale Price £30 (UKP) +P&P (and import tax if aplicable to your country) . Pleae Email me on Marcony@StateOfAnchovy.co.uk to enquire and buy. A hand drawn pieces of art by Marcony. 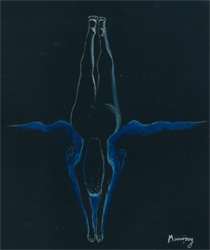 Created with pastel on heveay black paper as the first of an on going series of charaters diving. A hand drawn pieces of art by Marcony. Created with pastel on grey paper for a cartoon contest in I (The newspaper) and also shown on State Of Anchovy. This piece was conceived in 2011 after a speech where Prime Minister David Cameron blamed the summer riots on a feral underclass. Sale Price £35 (UKP) +P&P (and import tax if aplicable to your country). Pleae Email me on Marcony@StateOfAnchovy.co.uk to enquire and buy. A hand drawn pieces of art by Marcony. Created with pastel on dark green paper for a cartoon contest in I (The newspaper) and also shown on State Of Anchovy. 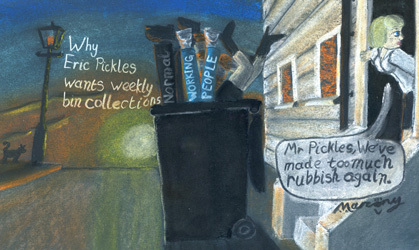 This piece was conceived in late 2011 on the day Eric Pickles announced that councils would be bribed with millions of pounds to return to weekly bin collections despite the cost to the country that was at the time sufferign extream austerity and job losses in all other areas due to the worst recession in living memory and the increased damage to the enviroment from the Co2 emmitted by the exrea bin lorries. Sale Price £35 (UKP) +P&P (and import tax if aplicable to your country) Prices do not include shipping or such tax as must be paid to import items to your country unless otherwise specified. Pleae Email me on Marcony@StateOfAnchovy.co.uk to enquire and buy. A hand drawn pieces of art by Marcony in pastel on yellow paper. 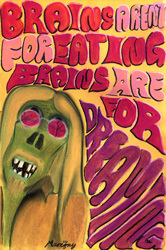 State of Anchovy cartoon from October '11 features Dave the Zomby Hippy and the line "Brains Aren't For Eating, Brains Are For Dreaming." Sale Price £30 (UKP) +P&P (and import tax if aplicable to your country) Mail Marcony@StateOfAnchovy.co.uk to enquire and buy. 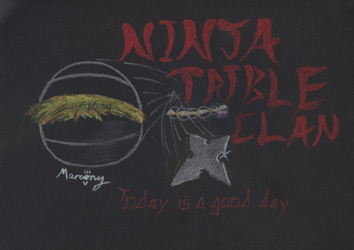 A hand drawn pieces of art by Marcony in pastel on black paper. 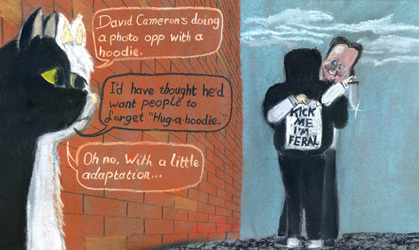 This strip from April '11 is a re-working of strip from '02. Sale Price £15 (UKP) +P&P (and import tax if aplicable to your country) Mail Marcony@StateOfAnchovy.co.uk to enquire and buy. Sale Price £25 (UKP) +P&P (and import tax if aplicable to your country) Mail Marcony@StateOfAnchovy.co.uk to enquire and buy. 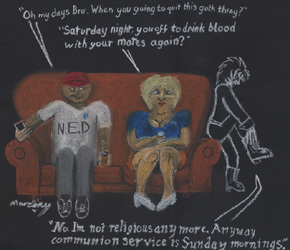 This Goth Moves strip from April '11 is a re-working of the very first Goth Moves strip and deals with the confusion between Goths, Vampiers and Christians. It stars Dave The Goth, Ned and Marsha. Mail Marcony@StateOfAnchovy.co.uk to enquire and buy.